Clark Industrial is a leading provider of liquid fertiliser storage. 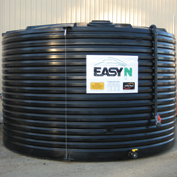 Suitable for either industrial or on-farm storage, our extensive range of fertiliser storage tanks has the capability to hold liquid fertilisers with a specific gravity of SG 1.5 or SG 2. At Clark Industrial, we take pride in the reputation we have established in this field and plan to maintain it by continuing to provide an outstanding product and excellent customer service. Over the years, we have built close relationships with some of Australia’s largest suppliers of fertilisers. As a result, Clark Industrial has been able to work with these companies to custom-engineer their fertiliser storage tanks for optimum performance.